HOUSTON, TEXAS (June 22, 2018) Christine Sinclair playing in her 100 NWSL match for the Portland Thorns FC (shown right) celebrated with a goal an assist to lead PTFC to a 3-1 win over the Houston Dash. Portland, in fourth place, and coming off a loss in Chicago wanted to make a statement here in Houston where they have never lost. 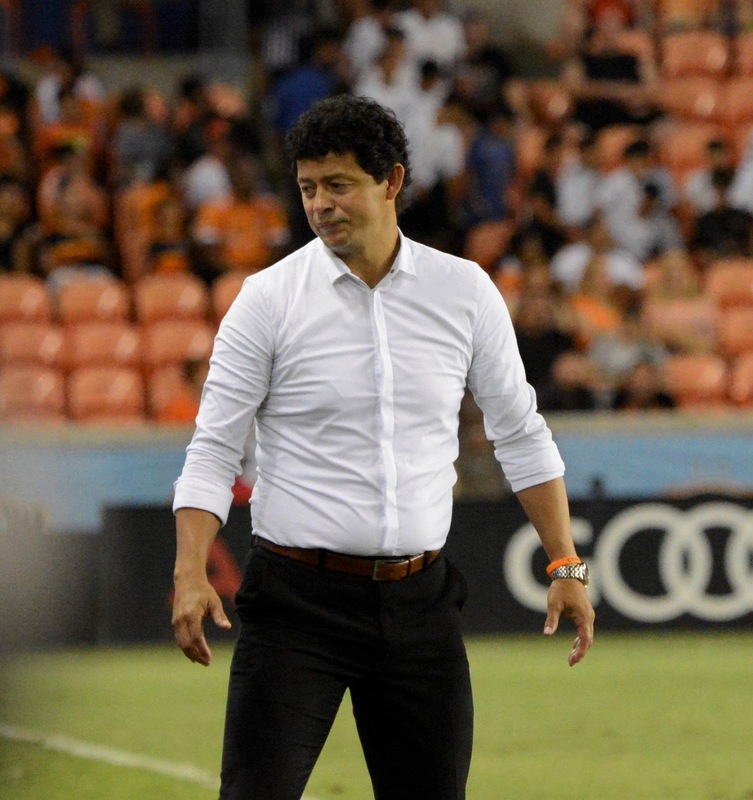 Portland secured the three points and slowed down a Houston team that was starting three new faces with minimal training time together. Portland got on the board early as Tobin Heath (shown left) scored in the ninth minute of play. Sinclair played a quick one two in midfield with Ellie Carpenter and found herself running at the Dash defense. Crnogorcevic dummied the ball to allow Heath through and the midfielder made no mistake, passing the ball into the net with the outside of her boot at Jane Campbell’s near post. Although PTFC would allow the equalizer just three minutes later to Sofia Huerta, goalkeeper Adrianna Franch in her first game back would clamp down allowing nothing the rest of the way. Portland got the go ahead goal in the 33rd minute. Once again it was Sinclair who got things started playing a ball down the line to former Dash defender Meghan Klingenberg. The defender’s cross found Crngorcevic whose first attempt was blocked by Campbell but the rebound came right back to her and a slow motion header found the back of the net for a 2-1 lead. Sinclair would finish Houston off with her league leading seventh goal of the season in the 83rd minute. Portland (5-4-4, 19 points) welcomes winless Sky Blue to Providence Park on Wednesday June 27. Kick-off is slated for 7:30 p.m.
HOUSTON, TEXAS (June 22, 2018) It only took 12 minutes for newcomer Sofia Huerta (shown left) to make her presence known to the Houston Dash fans at BBVA Compass Stadium on Friday evening. The 26-year-old midfielder, who was acquired, via a trade, from the Chicago Red Stars four days ago, scored her first goal as a member for the Dash in Houston's 3-1 loss to the Portland Thorns on Friday evening. Huerta, who was traded along with Taylor Comeau to the Dash, scored 22 goals and tallied 11 assists in 74 appearances for the Red Stars since entering the league in 2015. The lone goal was not enough for Houston to down the Thorne, who scored the first goal of the match in the ninth minute by Tobin Heath. It was the second goal of the season for the 20-year-old, who has 133 caps for the United States Women's National Team. After the Dash tied the score in the twelfth minute on Huerta's score, and stoppage for a hydration break (30th minute), Ana Crongorcevic put the Thorns again up by one, in the 33rd minute, on a header inside the box. Her first attempt was rejected by Dash goalkeeper Jane Campbell, but the second-try rebound header found the mark. Portland added an insurance goal in the 83rd minute on an assist by Tyler Lussi. 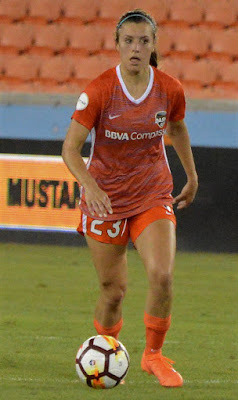 The game was the debut for Huerta, wearing the orange, sky blue and black of the Dash, who played three full seasons and 11 games in 2018 for the Red Stars. She earned her seventh cap for the USWNT on June 12 in a 2-1 win over China. She stated after the game, "I felt fine coming in, I just think that it was an unfortunate week with the rain and being unable to train some days, so I think that it messed with some stuff, but I think that we can only go forward from here. It’s a younger team and we’re just going to keep coming together as we keep having practices." Houston is currently in seventh place in the nine-team league; with three wins, five draws, and five loses (14 points). They will next face the Orlando Pride on Wednesday, June 27. The Pride are in a three-way tie for 2nd place in the league, with 19 points and posting a record of five wins, four draws, and three losses. In their first game against the Spring Storm, Deer Park won by the score of 9-8 in a four inning contest. They followed with a 10-5 thumping of the Cleveland All-Stars. The third game saw Deer Park drop a 12-8 decision to the Storm; in addition to dropping their final game of the tournament to the Friendswood Fire, 11-4. 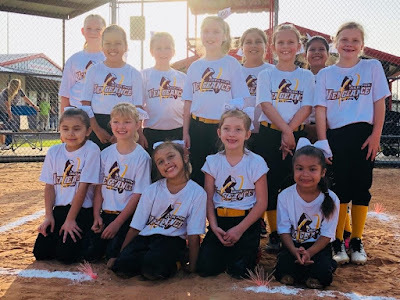 The Vengeance players are Brooke Sawyer, Gaby Sanchez, Chloe Willis, Morgan Meredith, Mikayla Garza, Kirstin Kelly, Emilee Mendoza, Reyna Calzonzint, Madison Jones, MerrieAnne Minor, Cambrie Johnson, and Aliyah Rodriguez. They are coached by Abel Mendoza, Larry King, Tim Willis, and Leah Jones. MOSCOW, RUSSIA (June 14, 2018) In the first match of the 2018 FIFA World Cup, host nation Russia completed dominated Saudi Arabia by the score of 5-0 at Luzhniki Stadium in Moscow. Russia, 70th in the latest FIFA rankings, scores two goals in added time to down Al-Suqour (The Falcons), whose highest placing in World Cup history was twelfth in 1994. Sbornaya, (The National Team) took a 2-0 lead into the locker room at halftime off the feet of Iury Gazinsky (12th minute) and Denis Cheryshev. (43rd minute). Arten Dzyuba also added an insurance goal in the 71st minute. The 3-0 lead was sufficient for the win after regulation, however the Russians kept the offensive pressure on the Saudis; scoring two addition goals in added time at the end of the game. Chershev scored his second goal of tournament (90th minute + 1 minute) to push the score to 4-0. Three minutes later, Aleksandr Golovin put the nail in the coffin of Saudi Arabia, to close out the scoring. Next up for Russia is a June 19 match-up against Egypt at Saint Petersburg Stadium in St. Petersburg while the Saudis will play Uruguay on June 20 at Kazan Stadium in Kazan. 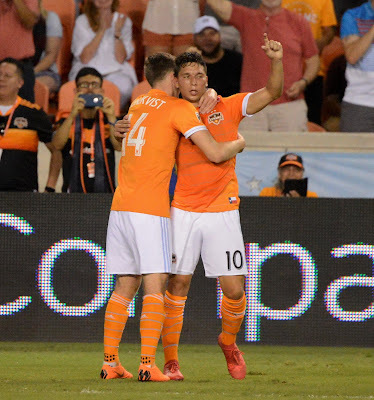 HOUSTON, TEXAS (June 9, 2018) The Houston Dynamo posted two goals within six minutes of each other to top the Colorado Rapids by the score at 2-0 at BBVA Compass Stadium in Houston, Texas. The first goal came in the 30th minute when midfielder Tomas Martinez found himself "in the right place at the right time" for his fourth goal of the season. The Argentinian started in 12 games this season and has scored six goals in his MLS career. Forward Mauro Manotas (No. 10 shown above) converted a penalty kick in the 36th minute to close the scoring in the match. It was the sixth goal of the year for the Colombian; matching his total from the 2016 season. “I hit the ball with my left and it bounced back, so I finished with my right. The truth is that he (Colorado goalkeeper Tim Howard) is a great goalkeeper who has a lot of experience and has been to World Cups. I’m content for scoring on him, ” said Manotas when talking to the media after the game. 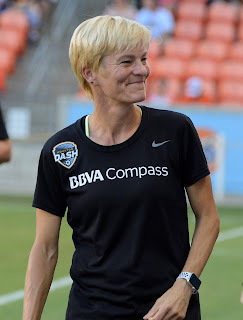 HOUSTON, TEXAS (June 3, 2018) Playing some of their best ball against the league leading North Carolina Courage, the Houston Dash battled to a one-all draw at BBVA Compass Stadium on Sunday evening. The draw was the best result the Dash has ever had against the Courage and extended the unbeaten streak to three. In three previous meetings, Houston dropped a 2-0 decision earlier this season, on April 28, 2018, at BBVA Compass Stadium; along with two losses in 2017. They lost 1-0 on September 9, 2017 and 4-0 on September 27, 2017. North Carolina players for the ball. North Carolina evened the score at one in the 79th minute on a goal by Frannie Course, in her first appearance for the Courage in 2018. She entered the game in the 63rd minute as a replacement for midfielder Meredith Speck. 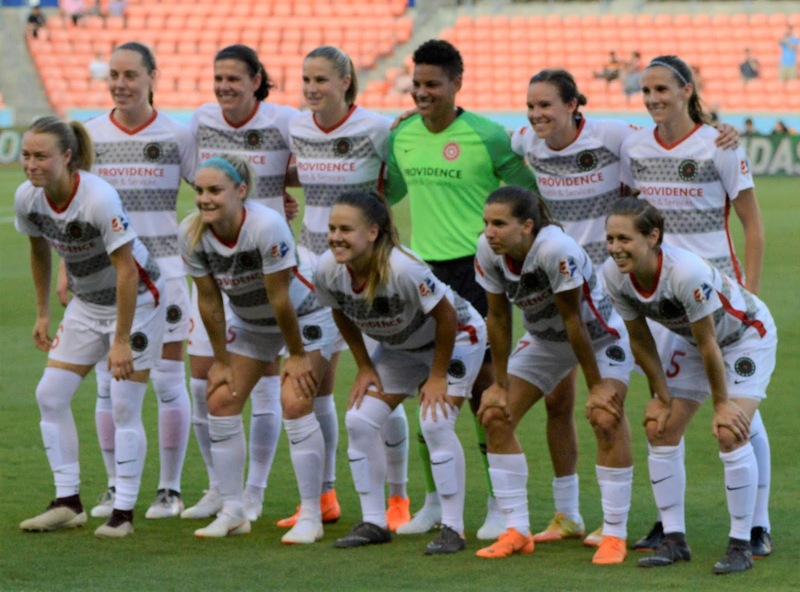 The draw brings Houston's record for the first half of the season to 3-4-5 (14 points) while the Courage continues to lead the National Women's Soccer League (NWSL) with a 9-0-3 record (30 points). The Dash are currently in seventh place in the NWSL. When Houston returns to play, after a 19-day break, they will face the Portland Thorns on Friday, June 22. The Thorns are currently 4-4-3 (15 points) with one of their three draw coming against the Dash on Wednesday, May 9.